Form 610 is a Michigan Department of Treasury form also known as the "Calculation Of Taxable Valuations Including Additions, Losses And Totals For Units Which Were Not Equalized As Assessed In 2017 Or 2018". The latest edition of the form was released in January 1, 2018 and is available for digital filing. 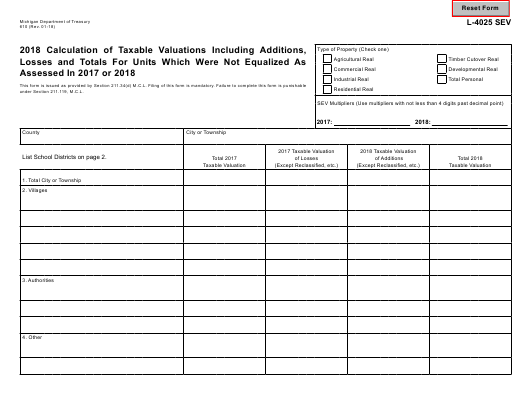 Download a fillable PDF version of the Form 610 down below or find it on Michigan Department of Treasury Forms website. List School Districts on page 2. DISTRIBUTION: The Equalization Department shall retain the completed forms on file for audit purposes.